Kamameshi bento) both ways(going and coming) on the Shinkansen. shiitake mushrooms, etc. It’s always fun to eat Ekiben on the trains. Daruma bento comes in a Daruma dolls. Daruma dolls are hollow and round Japanese wish dolls with no arms or legs,modelled after Bodhidharma. Kamameshi bento comes in a rustic earthenware pot. trains and train stations in Japan. Ekiben containers can be very attractive: made from plastic, wood, or ceramic. made from local food specialties. The “it’s DEMO” girls-only online convenient store knows what girls really want so well!. When you feel like getting something cheap & cute, or just want to feel nice and mellow by looking at those KAWAII stuff, you just go to “it’s DEMO” or “PLAZA STYLE”. Well, I know there are few more I adore, but can’t name them right now. You would often find yourself at those colorful & delightful shops as you enjoy looking around. And at the end, you just can’t help bringing something to the cash register! Kit Kat’s new flavor “caramel” is here! It stays in my bag these days – it will only be in season for so long. There are some famous “fruit shops” in Tokyo. They specialize in fruits that are delicious and as beautiful as jewels (and expensive)! However the Japanese have a traditional long-lasting custom that we give gifts to each other at every occasion. This is the shop we often go to buy something for those occasions. Most of these old established fruit shops have fruit parlours upstairs where you may find many colourful and delicious menus using those fruits the shops are proud of. I bet many people can’t resist this temptation very often. One of the most irresistible is a fruit sandwich which shows the sides of all fruits sliced thinly stacked up inside sparkling like a jewellery box. They also told me that they make this sandwich with sliced fruits and sour cream inside with lemon buttered breads. Please try one of these if you are tempted! I love eating ice cream on the couch in a warm room when it’s cold outside. “pino” is one of the most popular ice cream in Japan. this is one of my favorite flavor “milk tea “,BUT hurry up,it’s a limited edition. 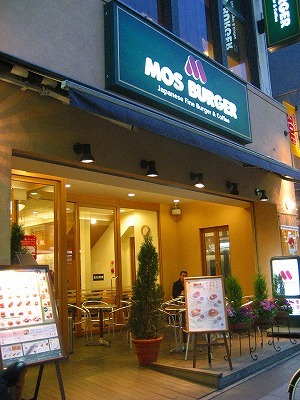 MOS Burger, it means from the initial letters of “Mountain,Ocean,Sun” is a fast-food restaurant chain (fast-casual) that originated in Japan. “M” stands for Mountain – dignified and noble. “O” stands for Ocean – wide and vast. “S” stands for sun – vibrant and life-giving. MOS Burger offers a wide variety of unique and original MOS burger, as well as local specialities. Menu and styles might have changed but the MOS policy and passionate commitment to creating delicious,quality burgers has never changed. My favorite combination is Spicy Mos cheeseburger,Spicy chili dog, French fries and Onion rings with New England clam chowder soup and minestrone. There are also items called “rice burgers”. 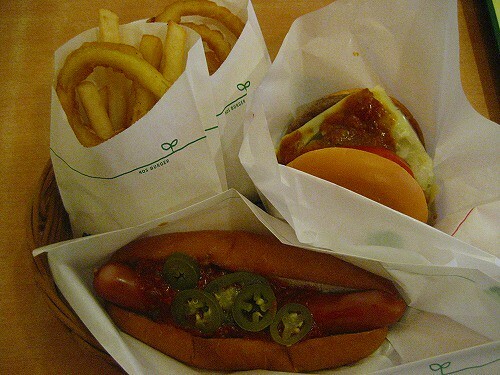 The buns are made of rice, and instead of patties,they have cooked shrimps or pork cutlets with miso sauce.